The town of Aloguinsan is not yet very well mapped out on Google Maps. When using Google Maps and, we suggest to type in Bojo River Cruise since you will take the same road. But Hermit's Cove is further ahead where you turn right when you see a directional sign. Take a bus from the Cebu South Bus Terminal to Pinamungajan. Buses to Aloguinsan are rare. 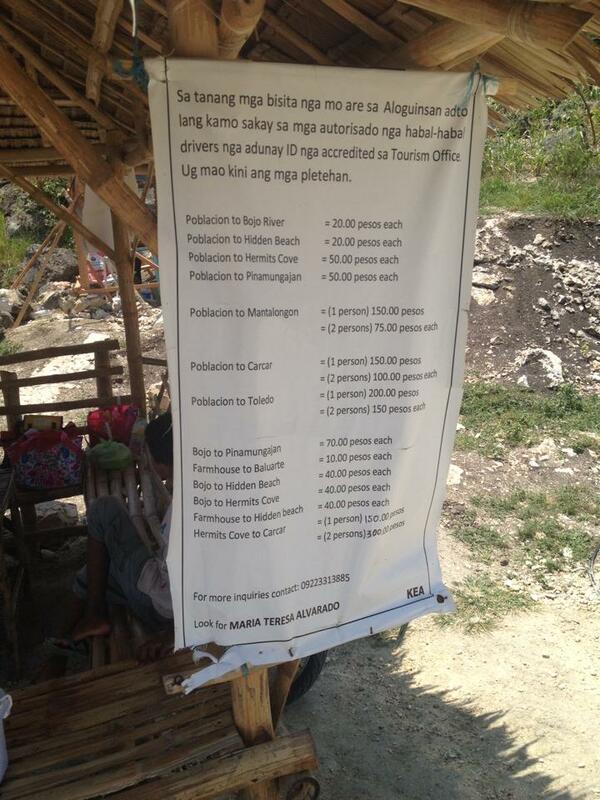 From Pinamungajan, take a habal-habal or motorcycle for hire to get to Hermit's Cove. Ride only on habal-habal motorcycles that are accredited by the Aloguinsan Tourism Office as indicated by their identification cards. Fares for habal-habal rides are indicated in the photo below. Just like any tourist place, entrance to Hermit's Cove is not free. A parking fee of PhP 15 was collected for our vehicle. Each person has to pay an admission fee of PhP 50. The fee covers the use of a cottage, the grill, the toilet, the shower, and the beach. A pail of clean water for bathing and washing is available near the portable toilet for PhP 20. Hermit's Cove is an ecotourism site and locals are tasked to manage and preserve the natural beauty of the place. So after we paid for the fees, Manang Odie asked us to stay for some orientation for first time visitors. She was one of the stewards at the place. Be responsible for their personal belongings. Immediately report accidents and injuries to the community. Tarpaulin posters where these community guidelines are printed on are placed conspicuously at various areas around Hermit's Cove. According to Manang Odie, a hermit once discovered this beautiful place. That is why it is called Hermit's Cove. The name of the hermit was Tabogon. Thus, the barangay was called Kantabogon. Kantabogon is a shortened version of Kang Tabogon. The phrase literally means owned by Tabogon. 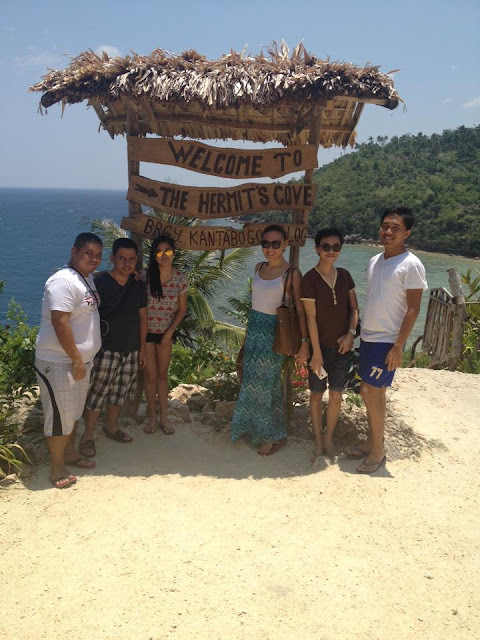 This explains why the barangay where the hermit lived is now called Kantabogon. We parked on top of a hill. We then had to descend through an 87-step stone and wood stairway to get to the beach. Once we started our descent, a nice overhead view of the beach was revealed to us. While I was driving, everyone else was asleep. Except for my brother who was helping me navigate through Google Maps. We were so focused on navigation that we totally forgot to buy food. We only remembered when we were just a few meters away from our destination. 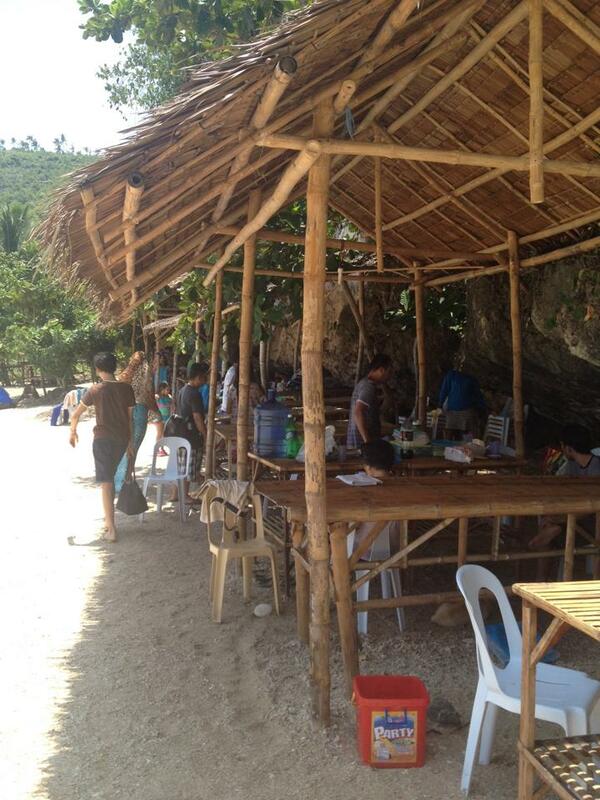 Thankfully, there were some vendors at Hermit's Cove selling some barbecue. We bought some dolopapa and some pork barbecue. Dolopapa is a type of barbecued squid. 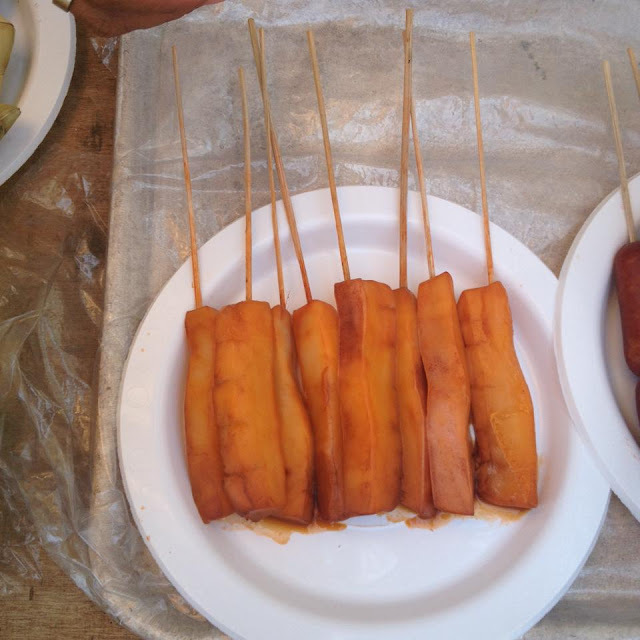 In the afternoon, we snacked on some fried cassava chips locally known as caycay. It was sweetened with latik or caramelized sugar. After enjoying the cold waters of the beach at Hermit's Cove, we were just about to get bored. So I approached one of the vendors and asked about what other possible things we can do aside from swimming or bathing in the beach or just basking in the hot afternoon sun. They suggested that we do a boating tour. 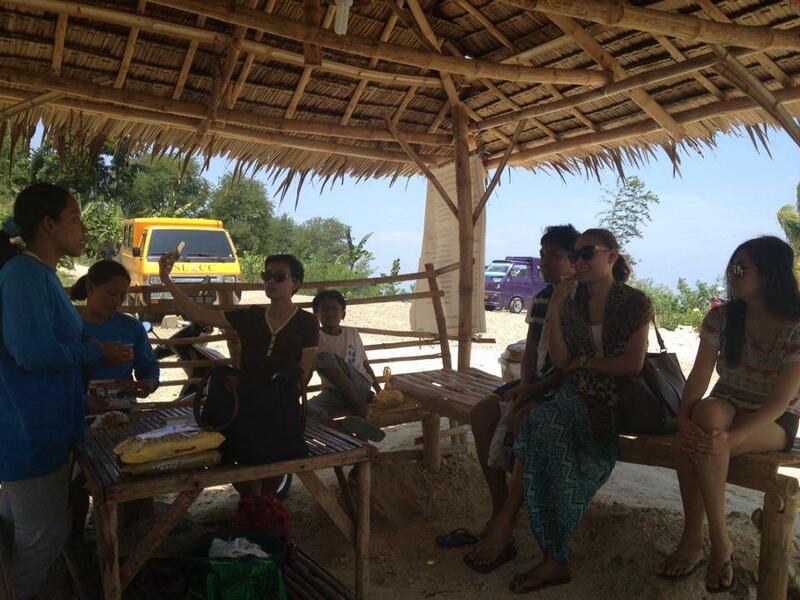 The boat tour will allow us to explore the rocky Aloguinsan coastline and get a glimpse of the Bojo river delta. We took the suggestion but got the scare of our lives with the big ocean waves. 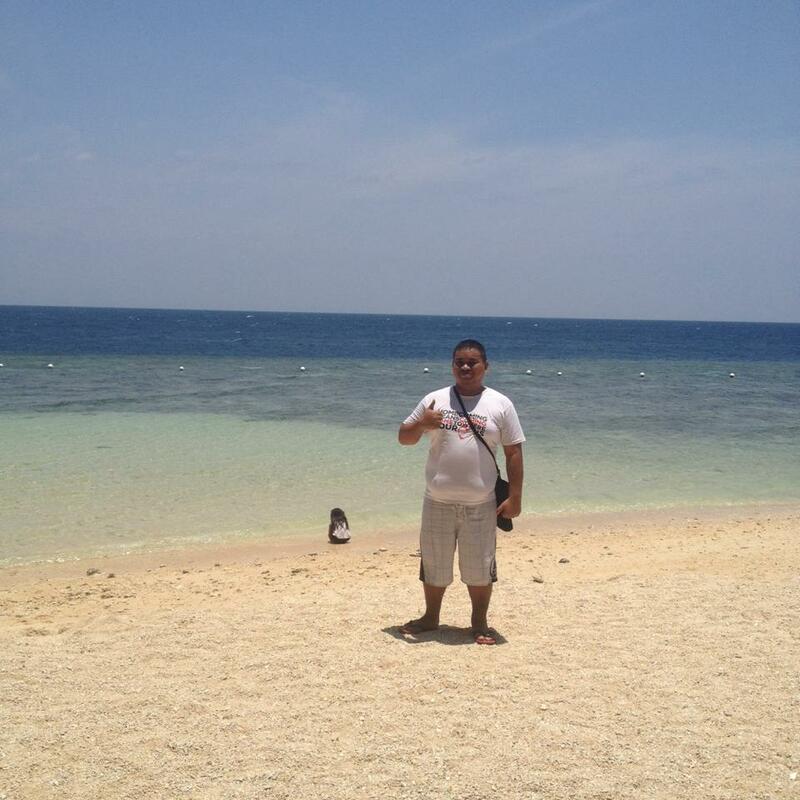 On days with better weather, we could have gone further to bathe in another beach,do some turtle watching and even some early morning dolphin watching at the Tañon Strait. Another association also facilitates snorkeling at Hermit's Cove with trained snorkeling guides. On the day we went, they weren't there. That's because it was dangerous to do snorkeling with strong winds whipping up big waves. Have you been to Hermit's Cove? We want to know about your experience. You may share them in the comments below. hi! is that Ram in your upper photo? the guy wearing blue jersey shorts with the number 77? I've read about this somewhere or basin sa FB to but will definitely put this on where-to list next summer. 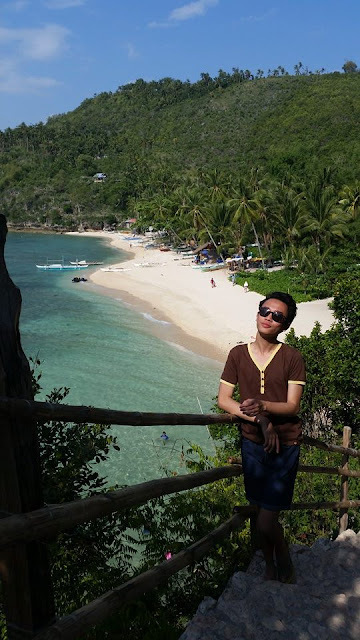 Cebu has lots of beautiful places to visit and some of them are not famous pa. Hhhmmm. I just hope puede magdala toddlers dri. I usually explore with my family, and with that including 3 little kiddos. Daghan pa gyud places sa Cebu nga di pa mainstream pero nindot. 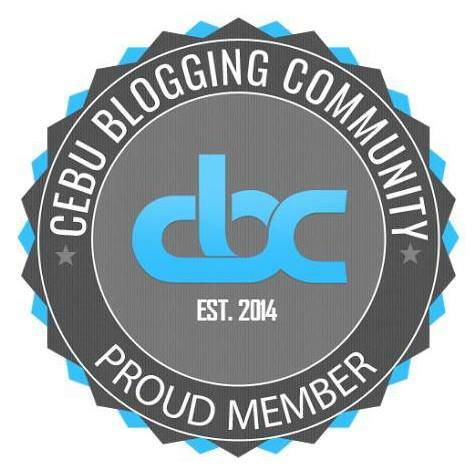 Let's keep discovering the beauty of Cebu. My photography skills are average at best. My photos do no justice to the beauty of this place. 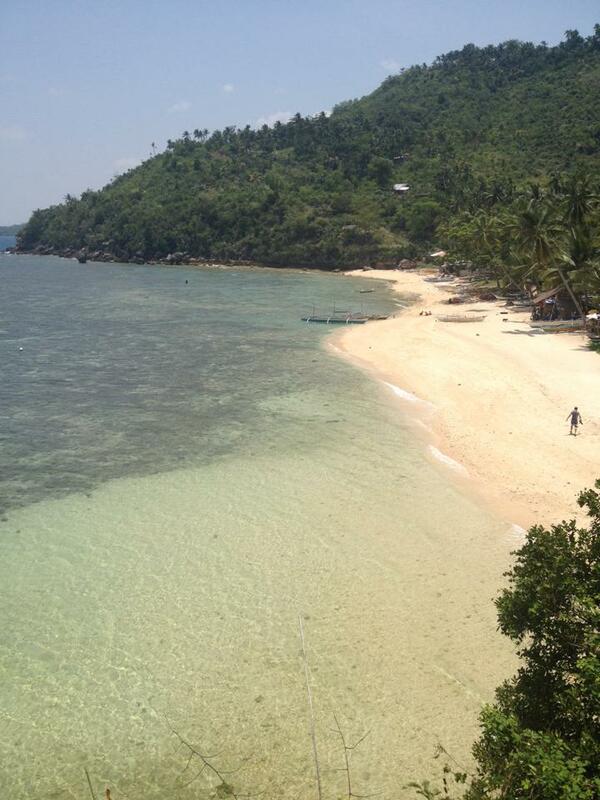 Looks very serene ang place. I think perfect ni for family getaways since wholesome nga place, no drinking and all. :) BTW quick question, lahi sad nang DaanTabogon? or part na sila? Di ko familiar kaayo sa atong places but I've been to DaanTabogon once, last summer, so maybe I'd pay this a visit if duol lang sila. The beach looks fantastic! I heard about the place and a friend of mine said that he'd bring us there. Can't wait! I understand the excitement. I pray you get there soon. Wow! Hermit's Cove looks stunning! It's nice that they have rules to maintain the wholesomeness and peace of the place. This is perfect for anyone looking for a relaxing getaway! Worthy addition to your bucket list! I've only heard of waterfalls in alegria but didn't know they had this beautiful beach tucked away!! Awesome! I've heard so much about the Hermit's Cove and now my it has also piqued my interest to maybe go here when the right time comes. BTW, can we do overnights here? It's really remote, I drove to a hill then lo and behold, Hermit's Cove! You can pitch a tent here Jazz but no commercial resorts in the area. Seems like a pretty cool place, and I appreciate the neat and thorough breakdown of your trip there. Might visit the place some time soon and I'll probably just take a look back at this post! Yey! Kahibaw nako what to expect this Saturday. Molaag mi ni Gay didto Sir Thadz! I had fun reading the list of NOs! Truly this is slowly getting into my news feed lately thanks to social media. I hope there will be other activities to do there so all the fees will be worth it. Still kudos to those who properly maintains the place before it gets mainstream. Sir Thads, I think I had commented on this post before. This is my official guide when I will hit Aloguinsan this month. But do I need to do a reservation if I visit the Hermit's cove? 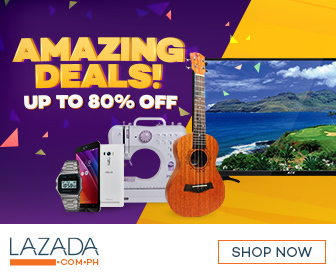 Halaaa, kamo ra duha?? Enjoy mo!